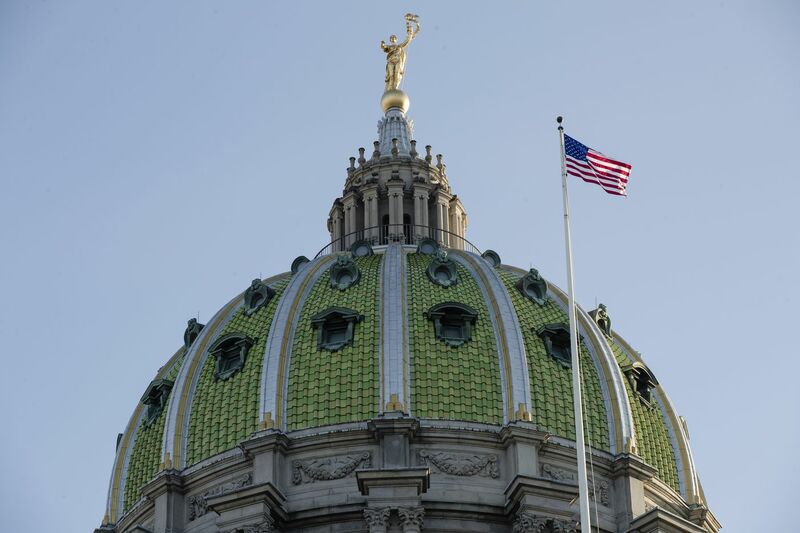 In this Jan. 15, 2019, file photo an America flag flies at the Pennsylvania Capitol building in Harrisburg, Pa. The rights of crime victims would be enshrined in the Pennsylvania Constitution under a proposed amendment that could go before the state’s voters later this year, but opponents warn the change has the potential to end up violating the rights of criminal defendants. In 1983, Marsy Nicholas was murdered by an ex-boyfriend. A few days after the murder, her brother, Henry, and his mother ran into him in a grocery store. He was out on bail and Marsy’s family was never notified. Henry Nicholas decided to advocate for victims’ rights, and in 2008, California passed the first Marsy’s law. The law is intended to protect the right of victims as vigorously we do the rights of the accused, and enshrine them in the constitution. Ever since, 11 other states have passed versions of Marsy’s law. This week, the Pennsylvania House of Representative took a major step toward amending the Commonwealth’s constitution. For the second consecutive session, the House passed Marsy’s law. The bill is now in the Senate. On Thursday, Philadelphia City Council is expected to pass a resolution in support of Marsy’s. The bill asserts that victims of crime have constitutional rights that should be taken into account by the courts, including being notified about developments in cases, from arrest to release, and having input into sentencing and parole hearings. In some cases, rights would extend to victims’ family members. But civil rights experts and defense attorneys argue that the amendment would have unintended consequences — often at the expense of the accused. Pennsylvania already has a strong victims’ rights law. In 1995, during the special sessions on crime, Pennsylvania established the Pennsylvania Office of Victim Advocate and enacted the Crime Victims Act. According to the law, victims of crime have the right to be notified of developments in the case of an alleged perpetrator, be told about plea deals before they are offered, give a victim’s impact statement in a sentencing hearing, and be heard in the decision to parole. Advocates of Marsy’s law, including Pennsylvania’s Victims Advocate Jennifer Storm, argue that while Pennsylvania has a victims’ services system that is better than most other states, a constitutional amendment would give the victim the ability to petition the court. It is unclear what remedies to those petitions might be. If a person has been paroled and released from prison, but the victim did not have the opportunity to be heard, should that parole be revoked? Should they be retaken into custody? If the district attorney’s office doesn’t notify a victim that a defendant was released on bail, should the bail be nullified? The American Civil Liberties Union of Pennsylvania opposes the bill and in a memo to the General Assembly expressed concern that the amendment would threaten due process and have unintended consequences. They point out that giving vigorous constitutional protections to the accused is necessary so when the state deprives someone of liberty or life, it is done in a just way. To amend the constitution in Pennsylvania, a bill needs to pass in both chambers of the General Assembly in two consecutive sessions and then it can get on the ballot. Instead of amending the constitution, the state should invest resources to improve compliance with the Crime Victims Act. Victims deserve to be heard, and their rights should be respected. It should not require them to appeal to the court.